After a brief love affair with orange, I’m ready to re-commit to turquoise. I met with my thesis supervisor the other day, wearing my orange dress, and she was wearing a richly coloured turquoise silk blouse with stunningly glittery turquoise jewellery. I was so jealous! She complimented my dress and I her blouse. Then I told her turquoise is my favorite colour. I think I might have drooled a little as I said it. Guess what her favorite colour is? ORANGE. We should have swapped ensembles, because on the walk back to my car I had more than one older gentleman (of the non-bathing variety) tell me I look “good in orange, sweetie”. Then, a police offer meant to be directing traffic sauntered over to chat with me while I waited for my turn to cross the street. Later, at a mall, some random fella urgently had to tell me my dress was pretty as I went up the escalator and he went down on the other side. All complimentors were odd-ish, and almost feverish in the way they had to tell me how great the dress is. The dress is like weirdo catnip. Either that, or it was tucked into my underpants all day. My bike (which I’ve been riding again with Hubby, after a five year hiatus) is a gold-y orange colour. Hmmm, I should probably play it safe and get some turquoise tires. I love these turquoise tires. I definitely don’t waste precious research time pouring over US Magazine. 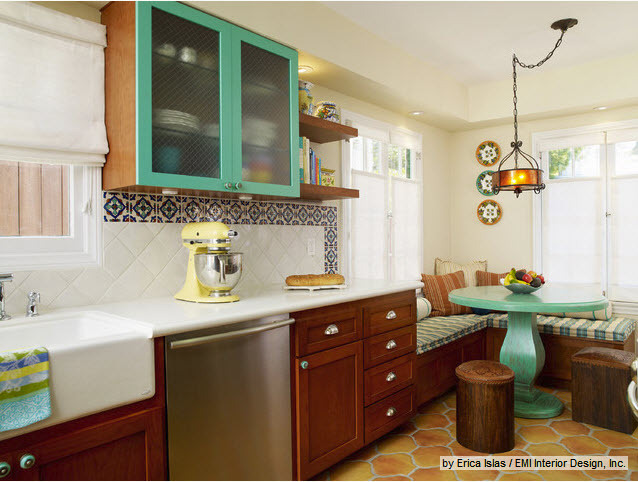 I love the idea of painting just some cabinets turquoise. I’d paint the rest a creamy white or soft grey, although the wood looks nice too – very vintage inspired. Of course this is up my alley: a bright white space with a few key elements in saturated hues. I was way too scared to pick a statement-making chandelier for fear of turning off prospective buyers, when the time comes. But in our next place I want to go bold on some of the more permanent fixtures, like lighting. 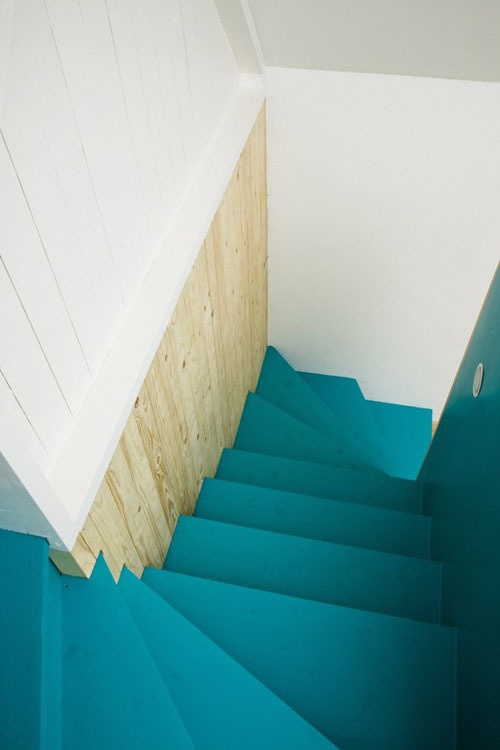 I have a long list of things I’d love in turquoise, including turquoise stairs . 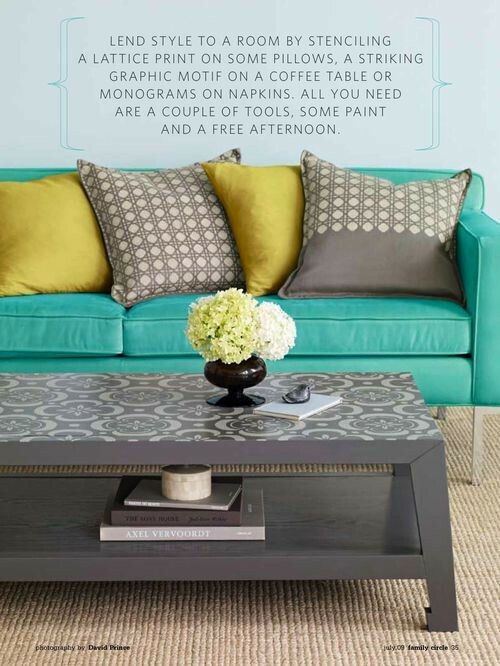 . .
A turquoise sofa . . .
Turquoise walls . . . I thought the stairs were cool.I really want to see that orange dress. Spot the dress in this post:http://dans-le-townhouse.blogspot.ca/2012/08/diy-agate-necklace.htmlAnd I love the stairs, too!! I love turquoise. Love love love. Half of my Pinterest pins are from House of Turquoise. Or of other turquoise things. These days, I've been kind of into yellow, but, like you, I keep coming back to turquoise. Looks like there is competition for turquoise finds! Well, I have a few awesomely turquoise DIYs coming up you will love! 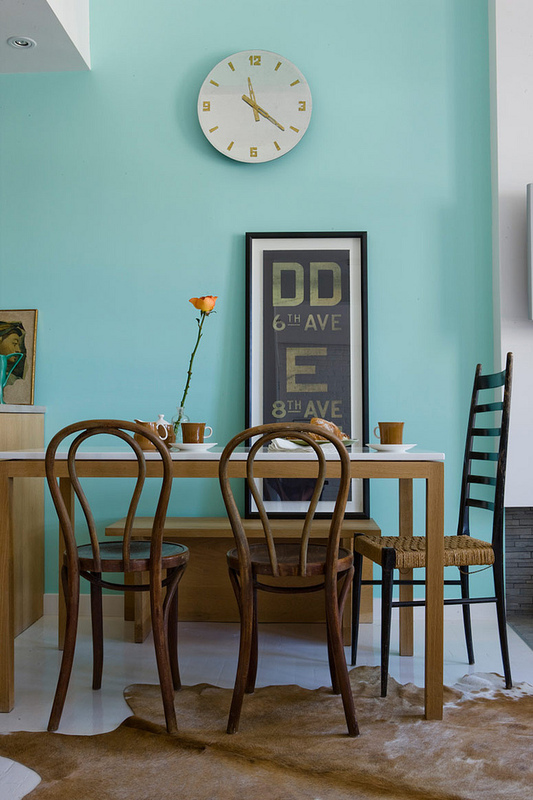 Another turquoise lover here, there's just something about the colour it's bold but also soothing. Those turquoise bike tires are making me swoon! Aren't they awesome? Bet that bike was pricey . . .
Weirdo catnip…LOL. I actually have that same dress (if it's Calvin Klein) in – you guessed it – turquoise! I love turquoise, so much. I'm putting pops of it in our bedroom – having a chair recovered in a lighter turquoise/robin's egg, and a pillow for the bed. Also going to use some downstairs in the reno paired with seafoam, cobalt & greens. It goes with everything! Fantastic inspiration pics! It IS CK and I'm jealous you have it in turquoise!! Of course you do, we were cut from the same cloth (pun intended). I could only find orange, but loved the cut. I am stealing yours when I come to visit. On an unrelated note, what size is yours? Want to make sure it will fit me, lol.Can't wait to see your bedroom come together! I do pretty routine cleanings of my cocktail dress collection (yes… unfortunately it IS a collection) so if that one is ever on the chopping block, I'll wrap it up and send it your way! I think it's a 6? Maybe a 4. Can't remember. Love the cut too – very retro. I pair it with a big turquoise/green capiz necklace, which you'd also love, LOL! I am on a torquoise kick too thinking about our master bedroom scheme! I want to see what that orange dress looks like lady, it sounds like you rocked it!! I linked it up in the post – click the words "orange dress". Or, check out the agate necklace post:http://dans-le-townhouse.blogspot.ca/2012/08/diy-agate-necklace.htmlIt doesn't look that awesome on me. It just has magical powers, haha. Because you live in Ottawa too, I recommend skipping on orange so the weirdos don't stalk you too, Gemma! Love turquoise! These are such beautiful inspirations. My living room walls are turquoise. I have deep turquoise throw pillows on the couch, turquoise accents in the pea green dining room, light turquoise bathroom with black and white tile. I love me some turquoise! But I like orange too! One bedroom is the same pea green with orange accents. Ooo – sounds gorgeous!! 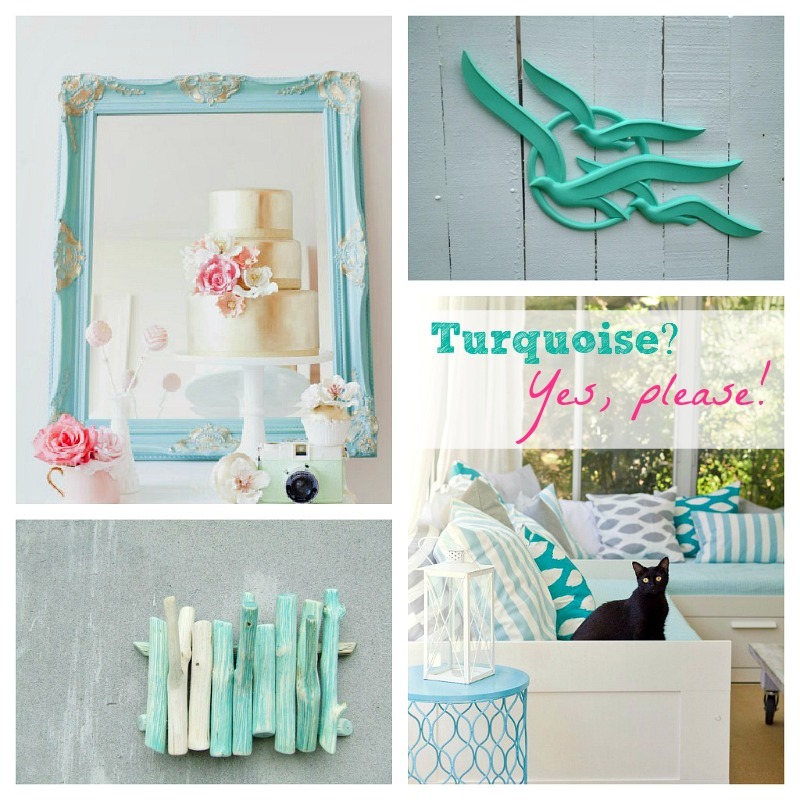 You are definitely a turquoise fan!! I love turquoise too, especially combined with apple green and purple 🙂 I don't have a lot of turquoise in my house, although the wall colour in the family room magically turns a cool shade of turquoise at night 🙂 Love that chandelier, it definitely makes a statement! And the turquoise stairs are very cool. I love turquoise as well! I adore that chandelier! And the kitchen theme is really cool with only a few cabinets painted. I think we all want to see this orange dress too!! Haha, I'm blushing! It's linked up, but if you caught my post on my DIY agate necklace you've already seen it! But see, it only works on weirdos, that's why you don't remember it, lol. I'm so glad you posted that link to you in the orange dress as I was DYING to know what it looked like! It looks adorable on you! and I do love the color!